Comes with the same stylus as GT-185 that recognizes 2048 pressure levels, you can perform each stroke with accuracy and create a reality that you can feel. It is lightweight and fully covered by very fine rubber, which prevents slipping from your hands. Improved Performance - The 2nd generation of the GT-220 pen display has solved the problem of awaking from sleep mode, cursor offset, breaking lines; It optimized the overall linearity. 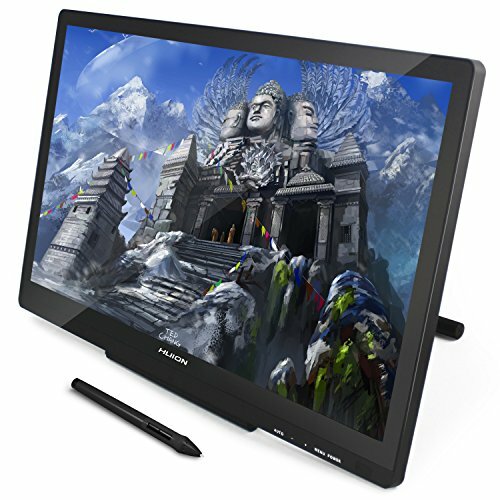 Upgraded Firmware - Provides a more accurate and responsive cursor positioning experience for drawing; It fulfills users the efficiency needed for greater productivity. 21.5'' IPS Monitor - With 16.7 million colors and 1920x1080 resolution, the new GT-220 gives you the most colorful screen display. The aspect ratio of is 16:9, the contrast ratio 1000:1, brightness 250 cd/m2, and 14ms response time. Two Newly Designed Pens - Comes with the same stylus as GT-185 that recognizes 2048 pressure levels; It is lightweight and fully covered by very fine rubber. Viewing Angle: Vertical 178° Horizontal 178°, 5080LPI, 233PPS, VGA/DVI/HDMI ports available; OS compatibility: Windows 10, Windows 8, Windows 8.1, Windows 7 and Mac 10.8.0 or above; 1 year warranty. If you have any questions about this product by Huion, contact us by completing and submitting the form below. If you are looking for a specif part number, please include it with your message.